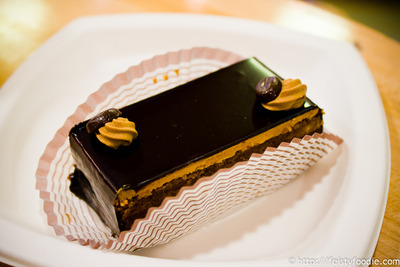 TC went for the opera cake. I tried a bite and it was super fudgey, and pretty good. I think TC liked it a lot. Unfortunately, I didn’t take a photo, but I also got a chocolate almond croissant. I wound up not eating it until either very late that night or early the next morning, but it was really, really good… easily the best chocolate almond croissant I’ve had to date (it’s one of my favorite types of croissants, followed closely by almond croissants). So good. Flaky, perfect texture, chocolate running through part of it, and just… amazing. So good. Buttery… delicious… I’ll be back for more. Yvo says: Obviously, Francois Payard knows his pastries… but goodness, that croissant haunts my dreams. If we’d not been in a bit of a hurry (I was trying to get things done so I could leave for the weekend), I’d have loved to linger over a croissant with a cup of coffee… such a cute shop too. Opera was good. Chocolate and espresso. Mmmm. Oh right, right. I got confused because I went to Dominique Ansel for the first time before Payard, but that day, Payard was first… I think. I thought right after Payard, we went to Parm and then REI? I may be confused though, that was almost 2 months ago! Payard def first, then Ansel before Chinatown for snacks. Parm (mmm chicken) and REI was after HK supermarket. Oh right, I forgot we walked to Chinatown too… wow that was a busy day! I love cheese croissants, followed closely by the chocolate almond. That cake is almost too pretty to eat. I don’t think I’ve ever had a cheese croissant, but I bet I’d love it! What? There’s a thing called chocolate almond croissant? Why haven’t I’ve been told of this? Where have you been?! It’s been around for ages. I like pain au chocolat but I vastly prefer croissants for their flakiness/butteriness, so almond croissants are my preference… then add a teensy bit of chocolate and you’re good. Mmmmmm… are we adding this to the list?